From world renowned soloists to advancing students, Arcus bows are in the hands of thousands of musicians around the world. Musicians, many of whom would never again wish to be without their Arcus bow. Why? Because it makes playing so much more enjoyable. For many players discovering the possibilities of these unique bows turned out to be quite an adventure. Initially they struggled to overcome long held prejudices, but almost all of them have retired their wooden bows for good. Musicians and instruments are quite individual. To be able to offer the ideal bow for every player, Arcus developed a wide range of bows with significant differences in their handling and in their sound. 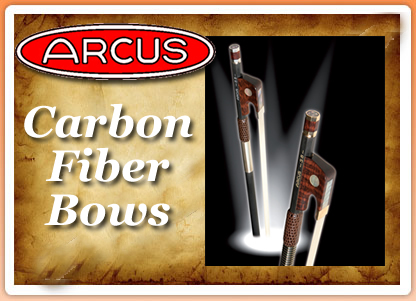 There is a lot to know before deciding on an Arcus bow to purchase. You probably want a lot of information before paying from about $1,100 to $10,000 for a bow. This warranty is NOT just for the original owner. Parts (e.g. frog and components) are covered by a 2-year warranty. The ever-increasing risk of having bows confiscated by Customs or other government agents overseeing import-export of products made from endangered species is becoming a big deal for musicians who travel across national borders (and even State borders within the U.S. and elsewhere). For example, if the tip of your bow is made from elephant ivory or, now, even so-called "fossil ivory" (e.g. mammoth tusk), kiss that bow goodbye if you cross any international border. Not a joke or exaggeration! Arcus bows contain no ivory, tortoiseshell, lizard skin, or other controlled (i.e. endangered, regulated or monitored) species. You may travel internationally with your Arcus bow with no worries or hassles at Customs in any country.